Nibor’s first Listener was way back in 1975. In that year, I was still working for my first employer and that really does seem a long time ago! 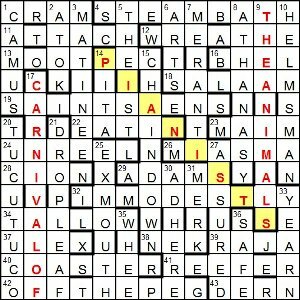 I see from the listenercrosswords.com web site that Nibor’s third Listener (no. 2557: Enigma Variations) in July 1980 had only 27 entries, five of which were incorrect. Hopefully, Safari wouldn’t be that tricky, but it would be interesting to tackle Enigma Variations sometime. 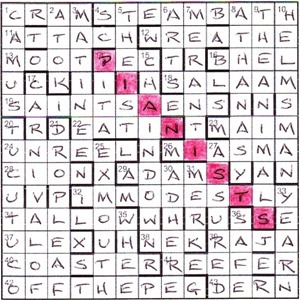 And so it seemed to go: a couple of tricky clues followed by an easy one to keep the grid getting filled. It wasn’t too long before Saint Somebody appeared at the unclued 19ac, and Saint Simon looked a likely candidate. Unfortunately 15dn Restain Restrain china ruined by fluff (9, two words) CHAIN DOWN eventually put paid to that giving an A for the saint’s second letter. Perhaps Saint Sally? It wasn’t long before it became clear that we were dealing with Camille SAINT-SAENS and The CARNIVAL OF THE ANIMALS, the unclued entries at 17dn and 9dn. At last there was a chance to determine the thematic set whose alternate letters were given by the restored letters. Without knowledge of the source, I suspect that L·O·C·I·K·N·O·A·E·S·O·T·I·E·… would have been difficult to unravel. In fact, they turned out to be the subjects of the piece’s movements: Lion Chickens Onagers Tortoises Elephant Kangaroos Fish Donkeys Cuckoo Birds Fossils Swan Finale. The missing item was PIANISTS which needed to be highlighted in a NW-SE diagonal. All that was left was to work out why 20dn Horn Shorn put up as capital on rodent (8) was TUCOTUCO! It took me some time to look in Chambers, as opposed to Mrs B, and find that I had overlooked the primary spelling for the rodent, which is TUCUTUCO (CUT< (shorn) + UT (as) + UC (Upper Case, ie capital) + O (on)). Thanks to Nibor for an enjoyable jaunt through the animal kingdom, although Fossils and Pianists do seem a trifle odd! This entry was posted on 4 July 2014 at 4:00 pm	and is filed under Solving Blogs. You can follow any responses to this entry through the RSS 2.0 feed. You can leave a response, or trackback from your own site.